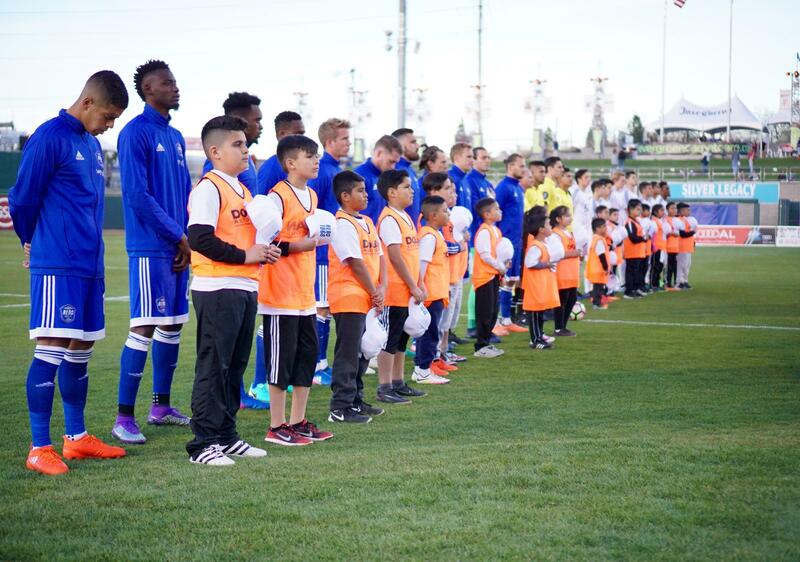 Reno 1868 FC players stand behind the youth soccer club participants of Reno Nevada before the start of the match, during the national anthem. 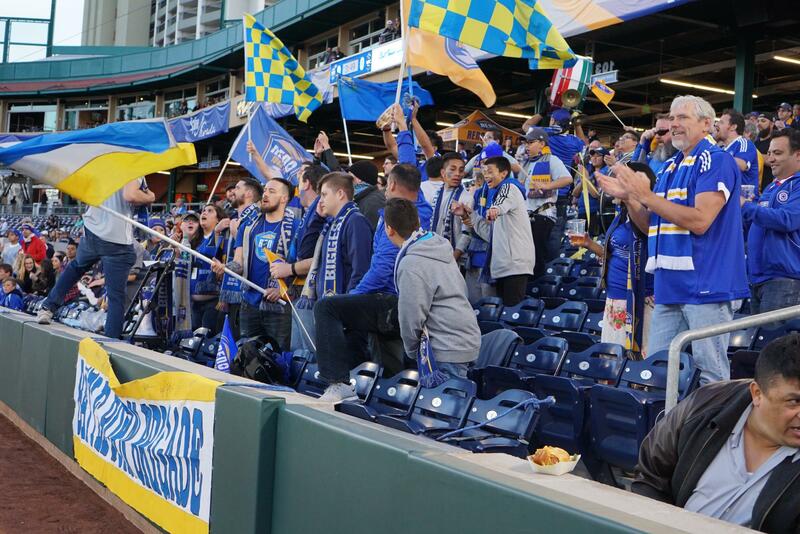 Reno’s first soccer team already has a loyal and growing fan base. Our reporter Stephanie Serrano, with Noticiero Móvil, explores why. A sea of blue and yellow stops traffic down Virginia Street as fans bang drums, wave flags and chant at the top of their lungs. Once in the stadium, they find their designated seats but they don’t sit down; the atmosphere is contagious. 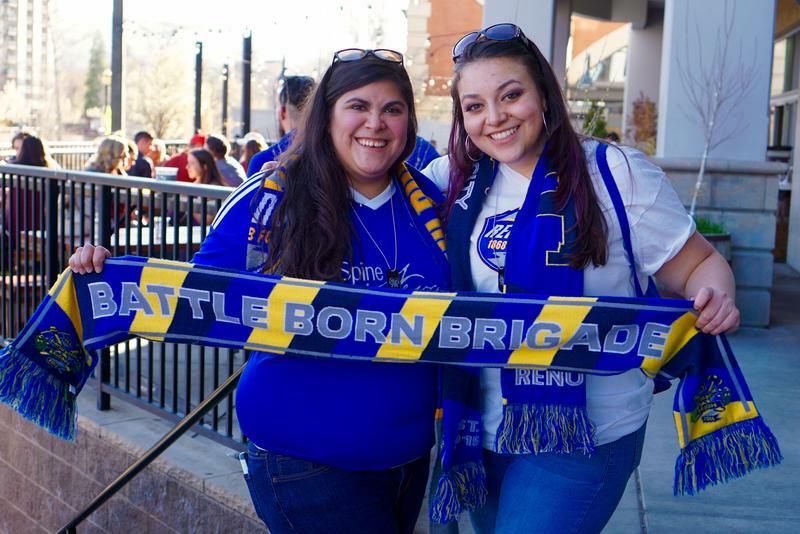 “It’s that feeling of being a family that really makes it amazing," says Laura Moreno, a self described soccer fanatic and a diehard member of the Battle Born Brigade, Reno’s first soccer fan club. Every game day, the Brigade meets at the iconic “Believe” sign at Reno City Plaza one hour before kick off. From there, about 50 or more people march through town into the Greater Nevada Field, home to both the Reno Aces and the city’s first professional Soccer team, Reno 1868 FC. Angela Rafferty and Laura Moreno have been part of the Battle Born Brigade from the very beginning. Thanks to the brigade, their friendship has blossomed. If you haven’t been to a soccer game before, you’ll notice the fans wear scarves – this is a tradition you’ll often see in European games as well. But before the big Saturday night game days happen, the players have business to take care of at practice. Ian Russell is in his first head coaching position with Reno 1868 FC. Prior to this, he was an assistant coach for the San Jose Earthquakes, Reno’s MLS affiliate. “For me, it is a humbling experience," says player Junior Burgos, "because I know that at one point I was a kid and I was looking up to my dad and his teammates and thinking, 'Wow, they’re my idols. These guys are amazing. I want to be like them.'" Burgos is 28-years-old and one of the most experienced players on the team. He was the first player in Cal Poly’s soccer history to be drafted to the major leagues, but his legacy really starts more than 1,600 miles away. Junior Burgos signs autographs at the end of the game. Fans are willing to get anything signed from Burgos, including T-shirts and mini soccer balls. 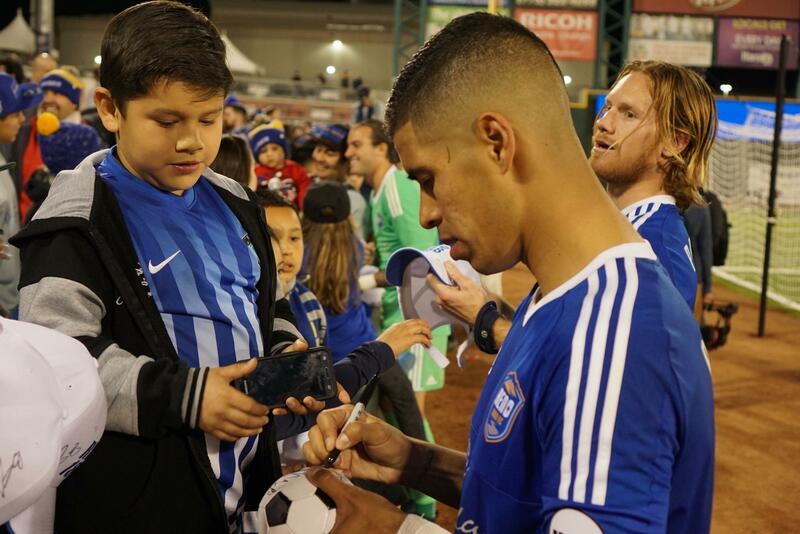 Burgos also plays for his national team El Salvador, and his ability to speak two languages helps him connect with his fans. Before each game, Burgos says he hangs up a rosary made of flower petals in his locker, given to him by his grandmother. He says a prayer, eats a chocolate caramel bar and heads to the field. Reno 1868 FC is only at the start of their season. They have a full schedule on the way as they play through the middle of October. Stephanie Serrano is a student reporter with Noticiero Móvil, which is a Spanish-English multimedia news outlet for Northern Nevada produced by the Reynolds School of Journalism. Funding for her reporting comes from KUNR and the Pack Internship Grant Program. Members of the Battle Born Brigade have special seating behind the goal at the Nevada Greater Field. The Greater Nevada Field is a unique shared space that houses the Reno Aces baseball team and Reno’s forthcoming soccer team. During last night’s test run, international clubs squared off in a friendly match. Standing among 1000’s of fans Aces President, Eric Edelstein (ed-uhl-steen), says the turnout shows how much local interest there is in the sport. Home games for Reno 1868 FC kick off at about 7:00 p.m. but for the Battle Born Brigade, game day starts as early as 4:00 p.m. The Battle Born Brigade is Reno 1868 FC's growing fan club of all ages. Every game day they meet at the iconic Believe sign in the middle of downtown Reno and march to the Greater Nevada Field where they chant original chants, bang drums and yell in support of their team. On Saturday, April 1 that is exactly what they did.